IMATS (International Makeup Artist Trade Show) is a yearly event comprised of thousands of makeup artists, vendors and beauty enthusiasts alike. 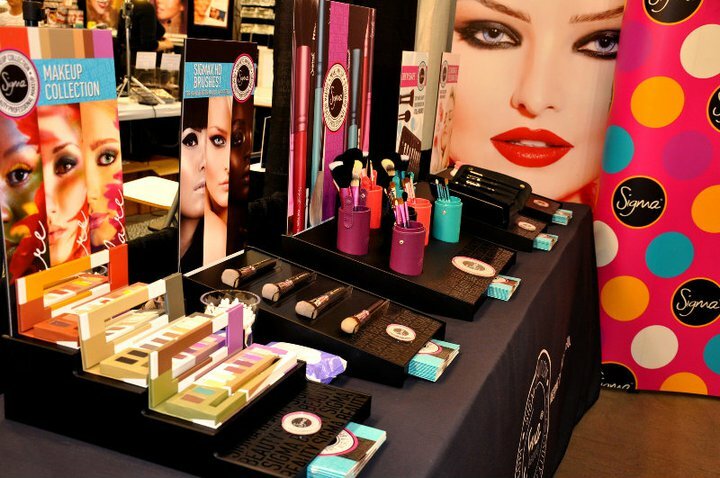 IMATS was founded in 1997 and has come to be the largest gathering for all things makeup-related to date! This popular trade show is held six times each year in various cities around the world including London, New York, Los Angeles, Vancouver, Sydney and Toronto. At IMATS you can expect to see several makeup exhibitors, YouTube’s top beauty gurus, classes and demonstrations from the most experienced makeup artists in the world, plus your favorite beauty brands… including Sigma! That’s right, Sigma will be at IMATS LA again this year, but this time around we have an extra-large booth! We will be selling a wide range of products, including our best-sellers such as the Mrs. Bunny Essential Kit, the limited edition Paris Makeup Palette, the Performance Eyes Kit, plus many more! Stop by, say hi and shop around! Not only will you receive a free gift and exclusive discounts on products, but a chance to get your makeup done by YouTube beauty gurus MakeupbyTiffanyD or Camila as well! I wish I could go! But I'll admire from a far. Love you Sigma!! wish I could go! ;( Hope everyone can take advantage! I will be there!!! Whoo hooo!! I will be sure to visit your booth. I just want to be clear the discount is just for people that are going to IMATS LA, right?? awe... I wish they could do the sale in honor of LA IMATS </3 I got so excited. Is this discount avail. online too or just at IMATS? Will be there Sunday! So excited you guys will be selling your products at the booth this year! The 15% discount is only going to be offered at IMATS. I'll be there Sunday! So excited you guys will be selling products this year! I'm from Brazil. Can I pay this prices if I by at the website? Are the things listed the only things that will be discounted? What about the Paris Palette??? Im dying to get it!! Keep creating new brushes and palettes! If you want Sigma stuff, just order it, even with the discount at IMATS it would still be cheaper since you don't want anything else from IMATS. the sale is also available online, right? do we need a code or something? Oooh, I want to goooo, but I'm so far. Hope everything will be just great!Luv Sigma. No, unfortunately we will not. The products that will be sold are listed above, plus the Paris Palette. are these the only products that are on sale? In addition to the Paris Palette, the products on the discount chart above are the ones that will be sold at IMATS. Will the Paris palette also be on sale for 15% off? i was wondering, is there an further discount for professional makeup artists? omigosh I love the IMATS!!!! I'll be attending both days and can't wait to visit your booth. Will the individual brushes be on sale at IMAT as well? Or just the sets you have listed? Thanks so much! Just the sets listed above. Will you guys still have lots of merchandise on Sunday, that is including the paris palette and the precision brushes. We will have whatever is left over from Saturday's sales. Correct, there will be no tax on our products at IMATS. The prices listed above are the final prices. I'm hoping you guys will make the trip out to IMATS Toronto some day soon????? Awww I wish I could be there! I have been wanting to get all three of your eyeshadow sets and at that price! Darn! I hope you guys have a great sale later this year for those of us who won't make it to IMATS! Too bad Brazil is so far away from California! I would go craaazy being there...and my wallet even crazier! Is there any way to make a reservation to have Tiffany do my makeup? What items are included in the Extravaganza Complete Kit? woooo! Glad ur selling this year was a bit disappointed last year but u guys were so nice & ur sample brush is one of my faves! Will u be selling individual brushes as well or just the kits? Sou louca pra ter esses pinceis maravilhoso e essas paletas de cores lindas, eu assisto os videos da Camila Coelho ela divulga muito bem os produtos de voces, gostaria muito de adquirir um kit seus.Amo maquiagens! Are you guys ever going to come to the Toronto IMATS? Possibly in the future but for now LA is the only IMATS we attend. how bout sydney IMATS this year? I think you should really try to make it out to all the IMATS next year especially Toronto!!! Please consider!!! Are you guys doing this in NYC IMATS as well? Are you guys going to be there?